In this study, the correlation between test motivation and performance on an economic knowledge test was investigated. To this end, the economic knowledge of 1018 students in vocational schools in Germany was assessed using a standardized test, and their self-reported test motivation and interest in receiving feedback on their performance on the test functioned as indicators of test motivation. The expectancy-value model served as the theoretical basis, while this paper followed Knekta and Eklöf (J Psychoeduc Assess 33(7):662–673, 2015) and focused on invested effort in particular. Further, the number of missing values on the test was examined as a potential external criterion for test motivation. The correlation between gender and test motivation being a subject of frequent discussion in the literature, gender was incorporated as a control variable into the modeling. 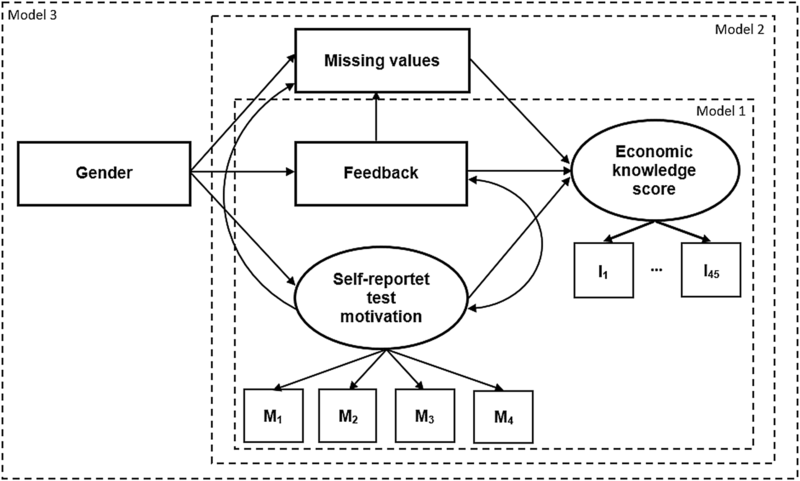 Three structural equation models of the results show that self-reported test motivation (direct indicator) and the number of missing values on the test (external criterion) correlated significantly with the economic knowledge test score achieved. Interest in receiving feedback (indirect indicator) had no significant correlation with the economic knowledge test score. However, there is a positive correlation between interest in receiving feedback and self-reported test motivation. The analyses taking into account gender show that there is no correlation between gender and interest in receiving feedback or gender and self-reported test motivation. There are, however, correlations between gender and the economic knowledge test score as well as between gender and the number of missing values. The findings underline the importance of a differentiated view on the assessment of correlations between test motivation and test performance. Thereby, dividing indicators of test motivation into direct (self-reported test motivation) and indirect (interest in receiving feedback) indicators, as well as taking into account the external criterion (number of missing values), in particular, were seen as the value added by this study. Although a test may be designed to measure knowledge, performance on that test may not be an accurate reflection of knowledge of the test construct. Test-takers’ motivation to try their best to answer all the questions correctly and thoroughly may influence their scores on the test. This is especially the case with low-stakes tests (see Kane 2006; Thelk et al. 2009; Wise and DeMars 2005), which usually are administered to measure academic achievement, identify learning problems, or inform instructional adjustments, and performance on them has no direct short- or long-term consequence for test-takers (Penk and Richter 2017, p. 55).1 As interpretation of test scores alone is valid to a limited degree only (Asseburg and Frey 2013, p. 92; Eklöf 2010a; Wise 2009), other important influences on performance on knowledge tests such as test motivation should be considered when interpreting results. Although numerous studies have been conducted of regular secondary school students’ performance on large-scale assessments such as PISA2 (Asseburg and Frey 2013) and TIMSS3 (Eklöf 2008), very few have been conducted on vocational school students’ performance on such tests (e.g., Baethge et al. 2006; Winther and Achtenhagen 2009). This is not surprising considering the difficulty in producing large-scale assessments for the diverse types of vocational school and their heterogeneous student bodies (see Billet 2011; Jacob and Solga 2015). While some vocational schools accommodate lower-ability students (e.g., within the transition system4), others cater to high-performance students (e.g., vocational secondary schools “berufliches Gymnasium”) (cf. Beicht and Walden 2016; Protsch and Solga 2015). The correlation between the ability of the test-takers and test motivation has been demonstrated by several studies (cf. Eklöf and Nyroos 2013; Penk and Richter 2017; Wise and DeMars 2005). In doing so, test motivation was conceptualized by means of students’ self-reported data on the importance of the test, motivation, invested effort, and test anxiety (Eklöf and Nyroos 2013; Wise and DeMars 2005) and on the expectancy and value components (e.g. perceived probability of success; Penk and Richter 2017), respectively. This data was collected in the course of an achievement test. Moreover, very few studies have been conducted of the influence of vocational school students’ test motivation on their test scores.5 The main aim of this study is to examine the correlation between vocational school students’ test motivation and their performance on an economic knowledge test. 1018 students from vocational secondary schools (berufliches Gymnasium), commercial vocational schools (Berufsausbildung) and upper vocational schools (Berufsoberschule) were surveyed during the second term of the 2015/2016 school year. The purpose of this project was to measure economic knowledge of students in vocational schools. To this end, a test instrument in a paper-and-pencil format was used (Happ et al. 2016), composed of 45 items in a multiple-choice format. For the assessment of test motivation, two indicators were applied in this paper (detailed in “Theoretical basis and state of research” section). Both direct assessment of test motivation through test-takers’ self-evaluation (1) and indirect assessment operationalized through the test-takers’ interest in receiving feedback on their test performance (2) were performed. Furthermore, the number of missing values on the economic knowledge test was incorporated into the modeling as external criterion that should correlate with test motivation.6 In addition to investigating the correlation between direct and indirect indicators of test motivation, another aim of this paper is to examine the correlation between both of the direct and indirect indicators for test motivation and the number of missing values (external criterion) and the scores on the economic knowledge test. Furthermore, the state of research regarding test motivation indicates differences between the two genders (on the theoretical backgrounds see “Theoretical basis and state of research” section) (cf. Butler and Adams 2007; Kornhauser et al. 2014; O’Neil et al. 2005). For this reason, the test-takers’ gender was also integrated into the analyses of this paper. In “Theoretical basis and state of research” section, the construct of test motivation and indicators thereof are examined, with the expectancy-value model serving as a basis and the paper focusing on invested effort. Also, hypotheses were formulated in “Theoretical basis and state of research” section. In “Measurement instrument and sample” section, information on the sample and details about the instruments used to collect data are provided. In “Statistical approach” section, the statistical approach is presented in three structural equation models. Results of latent variable modeling are presented in “Results” section and discussed in “Discussion” section. In “Conclusions and limitations” section, the conclusions and limitations of the study are presented. Baumert and Demmrich (2001, p. 441) define test motivation as “the willingness to engage in working on test items and to invest effort and persistence in this undertaking.” A similar understanding of test motivation can be found in Wise and DeMars (2005, p. 2): “We define test-taking effort as a student’s engagement and expenditure of energy toward the goal of attaining the highest possible score on the test.” Similarly in this study, test motivation is understood as the willingness to invest the greatest possible effort to perform well on a test. This means that the goal of a motivated test-taker is to obtain the highest possible score on a test. The expectancy-value model of achievement motivation by Wigfield and Eccles (2000) has proven to be helpful as a theoretical framework for defining test motivation. In this model, test motivation is a function of expectancy of success and relevance of a test to the test-taker, which together influence effort to complete a test. In a simplified schematic picture, Knekta and Eklöf (2015) demonstrate the application of the expectancy-value theory in a test situation. The expectancies and the task value are significant predictors of effort in this case. Effort, in turn, predicts significantly the performance in a test situation. Accordingly, both authors regard effort as an aspect of test motivation which results from expectancies as well as the task value and precedes action.7 The above definitions clarify that most test motivation definitions focus on invested effort. This paper focuses on the actual willingness to make an effort as a part of test motivation, not on explaining it by means of expectancy and value components. Consequently, only invested effort is taken into account (also cf. the selection of items in Table 3 in Appendix). Test-takers with a high level of test motivation exhibit more effort to answer questions correctly and thoroughly and demonstrate more commitment to completing all test items than test-takers with lower levels of test motivation (Baumert and Demmrich 2001). Consequently, ambiguities arise in the interpretation of test scores: It is unclear whether performance on a test is the result of having the necessary ability and/or the result of (missing) test motivation. Hence, misinterpretation of test scores may occur when influence factors are not considered or misidentified (Wise and DeMars 2005). For example, it is difficult to determine whether test items are ignored due to a low level of test motivation alone or whether other factors are at play and whether responses to test items are mere guesses without any significant effort being made (Knekta 2017). A covariate repeatedly discussed in research on test motivation is gender (cf. Finn 2015; Eklöf 2007; King 2016). Several studies indicate that women have a higher test motivation than men (cf. DeMars et al. 2013; Eklöf 2007; Marrs and Sigler 2012). Current research approaches explain this with specific characteristics associated with both of the genders, also in test situations. Thus King (2016, p. 62) characterizes women as having a higher level of self-discipline and a lower tendency to avoid work. According to DeMars et al. (2013), men take the line of least resistance und avoid unnecessary work. Men are thus characterized as work-avoidant. When the indicators for the test motivation are examined and further correlations are highlighted in this paper, the findings resulting from gender-specific differences in test motivation demonstrate that the gender should be controlled in these analyses. In addition, the results on standardized economic tests show, that men perform better on them than women (cf. Asarta et al. 2014; Beck et al. 1998; Happ et al. 2016; Walstad et al. 2013). Consequently, this paper can also examine if a part of this effect can be explained with varying test motivation or if the difference may even be larger when taking into account test motivation. To assess test motivation, various indicators can be analyzed. In this study, test-takers’ self-reported motivation and interest shown in receiving feedback on their performance on an economic knowledge test are explored as indicators of test motivation (“Indicators of test motivation” section). Also the number of missing values on the test is examined as an external criterion. Self-reported test motivation correlates positively with test performance. Some scholars question whether test-takers give truthful answers when reporting on their test motivation (Wise and Kong 2005). It is possible that responses are biased and self-knowledge related to test motivation as reported on in self-evaluations and assessed on Likert scales (Ziegler et al. 2011) is inaccurate. Also, giving socially desirable responses to questions about test motivation may be a way for test-takers to avoid potential negative consequences of expressing lack of motivation and consequently may skew interpretation of results (Wise and Kong 2005). Lastly, when a test-taker has low level of test motivation he or she may lack willingness to make an effort to report on test motivation (Finn 2015). Furthermore, if test motivation is self-reported upon completion of a test, it may be influenced by the expected test score: test-takers may, consciously or unconsciously, attribute their expected test scores to a low or high level of test motivation. Due to the unreliability of self-reported data alone, other indicators of test motivation should be investigated. Interest in receiving feedback on performance on a test may indicate test motivation (Kong et al. 2006; Liu et al. 2015, p. 81). Furthermore, Kong et al. (2006, p. 3) note that if test-takers know before starting a test that they will receive individual feedback on their performance, they are less likely to make guesses or finish the test hastily instead of thinking carefully about how to respond best to test items. In large-scale student assessments such as PISA students have been promised individual feedback (Baumert and Demmrich 2001, p. 448), which may influence their test motivation. Also, there might be more pressure to perform well on large-scale studies such as PISA due to the international visibility of results and ranking of countries. This type of group feedback may boost test motivation. The theoretical state of research regarding interest in receiving feedback indicates that promising feedback may result in a positive effect on invested effort and thus on test performance. Therefore, the indicator “interest in receiving feedback” should be taken into account not only due to the potential biases in self-reported measures. From a theoretical point of view, also, an effect resulting from “interest in receiving feedback” on invested effort can be expected. Hence, this indirect indicator of test motivation is also taken into account in this paper. Interest in receiving feedback correlates positively with test performance. Self-reported test motivation correlates positively with the interest in receiving feedback. An external criterion that should be associated with test motivation is the number of missing values (Finn 2015, p. 11; Stocking et al. 2001). If test-takers leave a large number of questions unanswered, this may be due to a low level of test motivation (Boe et al. 2002; Musekamp and Pearce 2016; Wise and Kong 2005) or it may be because they do not know the right answer (Shoemaker et al. 2000) or they are too slow in answering the test items so they cannot work on all the items. Thus, a low level of test motivation cannot automatically be assumed when there are many missing values on knowledge tests. In several studies, Musekamp et al. (2014) arranged test items in order of decreasing difficulty. The assumption was that due to the items becoming easier to answer for the test-takers, the number of missing values would decrease toward the end of the test. However, Musekamp and colleagues observed the opposite effect: the number of missing values increased toward the end of the test. This result can be attributed, inter alia, to the decreasing level of test motivation toward the end of the test. In this paper, the number of missing values is examined as an external criterion. The number of missing values is regarded not as an indicator of test motivation, but rather as an external criterion. It cannot be clearly established, from a theoretical point of view, if the missing values result from a low test motivation or from lack of knowledge. A combination of both reasons is also possible. It is clear that the number of missing values should correlate with test performance. Ultimately, missing values are frequently coded as wrong answers on performance tests, resulting in a lower test performance (cf. Baker and Seock-Ho 2004; Coates 2004; Schwab and Helm 2015). Test-takers with a lower self-reported motivation demonstrate a higher number of missing values. Test-takers with a lower interest in receiving feedback demonstrate a higher number of missing values. Sociodemographic variables of the participants such as type of school and gender were assessed in addition to their results on the TEL4-G. Upon completion of the TEL4-G, participants rated their test motivation on a scale (Knekta 2017; Ortner et al. 2014) containing four items (see Table 3 in Appendix) from the Test Attitude Survey by Arvey et al. (1990, p. 714) and the Student Opinion Scale of Sundre (2007, p. 4).14 When translating the items into German, Giermann (2012, p. 41) was followed. Participants rated their test motivation on a five-point Likert scale ranging from “strongly disagree” (−) to “strongly agree” (++). The items focus mostly on “invested effort” as an aspect of test motivation (see “Test motivation and invested effort” section). After rating their test motivation, the participants completed a feedback sheet on which they could generate an imaginary word15 to use four to six weeks later to obtain confidential feedback on their performance on the test. Both participation in the assessment and completion of the feedback sheet were voluntary and no direct (negative or positive) consequence of taking the test was evident; therefore, the assessment could be perceived as low-stakes (see Finn 2015). Accordingly, the participants who provided an imaginary word were assumed to have a high level of interest in receiving feedback on their performance on the test. The 1018 participants in the sample under investigation were students in 66 classes at seven vocational schools in the federal state of Rhineland-Palatinate, Germany. With 625 students (61.8%), the vocational secondary school (berufliches Gymnasium) had the largest share. There were 357 students (32.1%) who were in training at a commercial vocational school (kaufmännisch-verwaltende Berufsausbildung). With 32 students (3.2%), the upper vocational school (Berufsoberschule) had only a very small share in the sample. However, the correlation between test motivation and performance on an economic knowledge test being the main focus of this paper (and not the level of economic knowledge), the students of the upper vocational school were retained in the modeling. In Table 1 an overview is given of the descriptive distribution of several sociodemographic characteristics of participants in the sample. Missing values also are presented in the table. Gender distribution was more or less balanced, with a slightly higher percentage of female students (51.4%). A total of 28.6% of the test-takers did not provide an imaginary word on the feedback sheet and therefore did not receive feedback on their performance. Missing values on the imaginary word (2.3%) represent those participants who returned the test without the feedback sheet. It is not clear whether these test-takers accidentally took the sheet with them despite having generated an imaginary word or did not generate an imaginary word. Hence, the 23 questionnaires without the attached feedback sheet were considered as missing values. Participants rated on a 5-point Likert scale ranging from 0 (strongly disagree) to 4 (strongly agree) statements regarding their test motivation. The average value of 2.33 indicates moderate test motivation. With a score of roughly 23.56 of 45 points, the participants completed on average slightly more than half of the items on the TEL4-G correctly.16 In Table 4 in Appendix, a correlation matrix for the correlations between the variables involved can be found. To test the hypotheses, three structural equation models were specified in Mplus software version 7.3 (Muthén and Muthén 1998–2012; Byrne 2012; Kline 2016). These are illustrated in Fig. 1. In Table 2 an overview is given of the unstandardized and standardized path coefficients of the three models. In accordance with the theoretical assumptions discussed in “Theoretical basis and state of research” section, self-reported test motivation, interest in receiving feedback, and test scores were analyzed together in the first model (Model 1), allowing the correlation between the two indicators of test motivation to be examined. With the reported criteria (χ2 = 1491.3, df = 1173, p < .000; number of estimated model parameters = 115; RMSEA = .016 (90% CI .014/.019); CFI = .968; TLI = .967), Model 1 was interpreted as suitable and showing a good fit. Self-reported test motivation was found to have a highly significant influence on the test score of .329 (p < .001), and a highly significant correlation was found between self-reported test motivation and interest in receiving feedback [.171; (p < .001)]. This indicates that participants with a higher level of self-reported test motivation achieved higher scores on the test (H1). Furthermore, it shows that participants with a generally higher level of self-reported test motivation were more likely to express interest in receiving feedback on their performance on the test (H3). The correlation between the two indicators of test motivation was weak. Because interest in receiving feedback was coded dichotomously, little variance was found.18 The very weak correlation between interest in receiving feedback and test scores (.012; p = .716) was not significant (H2). In the second model (Model 2), the number of missing values on the test was added to the structures of Model 1. With the criteria (χ2 = 1573.704, df = 1220, p < .000; number of estimated model parameters = 120; RMSEA = .017 (90% CI .014/.019); CFI = .966; TLI = .964) Model 2 also was considered as suitable and having a good fit. The influence of self-reported test motivation on test scores decreased slightly, indicating a value of .296. The correlation, however, remained significant (p = .000) (H1). The newly added number of missing values had a significant negative influence (− .344; p < .001) on performance on the test. This is because missing values generally were interpreted as resulting from lack of knowledge and, thus, as incorrect responses to test items (Baker and Seock-Ho 2004; Coates 2004; Schwab and Helm 2015). Therefore, the two variables were not independent of each other, which was considered to be unproblematic in the present study. Furthermore, students who showed interest in receiving feedback by creating an imaginary word had fewer missing values on the test (− .098; p = .006) (H4.2). The influence of self-reported test motivation on the number of missing values (p = .052) was significant only marginally (H4.1). However, the influence of interest in receiving feedback on their performance on the test (p = .52), as in Model 1, was not significant. In the third model (Model 3) gender was taken into account in addition to the indicators of test motivation (DeMars et al. 2013). The model exhibited a good fit and quality (χ2 = 1675.368, df = 1268, p < .000; number of estimated model parameters = 122; RMSEA = .018 (90% CI .015/.020); CFI = .96; TLI = .958).19 Both self-reported test motivation (.32; p < .001) and the number of missing values (− .38; p < .001) correlated significantly with test scores (H1). Furthermore, the correlation between self-reported test motivation and interest in receiving feedback (.23; p < .001) as well as the influence of interest in receiving feedback on the missing values (− .142; p < .01) were maintained (H3 and H4.2). Gender correlated significantly with the number of missing values (− .164; p < .001) only. This means that male participants had fewer missing values than female participants. After incorporating gender into Model 3, the total variance explained in test scores was slightly greater than in Model 2 (R2-Model 2 = .226; R2-Model 3 = .26). In the analyses, self-reported test motivation had a significant influence on performance on the TEL4-G (H1). Surprisingly, no correlation was found between self-reported test motivation and the number of missing values on the domain-specific test (external criterion) (H4.1). A possible interpretation of this finding might be that the participants’ perception of their performance on the test influenced their subsequent self-reported test motivation, resulting in a greater correlation between test motivation and test scores instead of between test motivation and the number of missing values. This (potential) link between test motivation self-reported after completion of the test and perception of performance on the test might result in the interpretation of the correlation with the test score as a maximum correlation between test motivation and test score. Another reason might be that test scores are already controlled for student test motivation and thus all motivational parts of test scores are already accounted for by the test motivation scale so that “nothing is left” for missing values. In further studies, test motivation should be assessed before and during the test in order to estimate more accurately the extent to which it is potentially influenced by performance on the test. As described above, test motivation was interpreted as the result of perceived item difficulty, students’ individual skill (expectation component), and the relevance of the test to the test-taker (Wigfield and Eccles 2000) and, thus, is not assumed to be constant. Therefore, one can argue that perceived item difficulty and self-estimated performance were relevant for self-reported test motivation. At the same time, there was a moderate correlation between interest in receiving feedback and self-reported test motivation (H3). Interest in receiving feedback also correlated with the number of missing values (H4.2) but not with the latent test score. Interest in receiving feedback in particular can be seen as an indicator of relevance of the test for an individual while self-reported test motivation indicates the willingness to make an effort to complete the test, and thus can be interpreted as resulting from expectations and values (see “Test motivation and invested effort” section). The assessment of test motivation in this paper had some limitations. Self-efficacy as a relevant expectation component was not assessed. The focus of further studies could be on the development of value-and-expectation constructs over time and their influence on performance on tests. The findings in this study reveal that there are other indicators of test motivation in addition to self-reported test motivation that should be integrated into analyses for the purposes of incremental validation for assessment of test motivation (AERA et al. 2014). Moreover, it became clear that 11% of the test scores could be explained primarily by self-reported test motivation. This emphasizes the importance of taking test motivation into account when interpreting test scores. Over the past two decades, administration of low-stakes tests has increased in schools in Germany. Simultaneously, more research has been done on the correlation between test motivation and performance on tests. Results of studies conducted in Germany (cf. for example Penk et al. 2014) and of international studies (cf. for example Eklöf and Nyroos 2013; Wise and DeMars 2005) confirm the correlation between a low level of test motivation and test scores, particularly on low-stakes tests. Similar research in the field of vocational education is scarce (see for example Kögler and Rausch 2017). The present paper demonstrates that in vocational education, too, a significant correlation must be postulated between test motivation and scores on a standardized test. Two indicators of the operationalization of test motivation were investigated in this study. This procedure distinguishes the present study from numerous other studies on test motivation. Incorporating interest in receiving feedback in particular can be regarded as innovative for the vocational education sector. Economic knowledge ought to be of particular interest to vocational school students in Germany because economic content often is incorporated into the curriculum.20 Before doing the test, the participants were given the opportunity to receive feedback on their performance on the test as an incentive to complete the test as accurately and thoroughly as possible. In this light, the overall moderate self-reported test motivation is considered to be critical. Due to the limited number of participants in this sample, particularly from upper-vocational schools, a comparison of self-reported test motivation was not performed. Considering the pronounced heterogeneity in student bodies within and across the vocational schools where data were collected, in future studies differentiated analyses should be performed according to the type of school.21 With the vocational education student body in mind, samples should include more low-ability students (e.g., from the transition system). This would not only increase the representativeness of the survey but also enable exciting comparative analyses of the students from the diverse school types (see “Relevance” section). There are some limitations to this study which should be mentioned. First, the sample included students from vocational schools in one federal state only. Therefore, the results of this study are not representative of all students in vocational schools throughout Germany. Second, the selection of schools in Rhineland-Palatinate to participate in this study was not random. Generally, willingness to cooperate and interest in the study were criteria needed to gain access to students of a vocational school. Neither self-reported test motivation nor interest in receiving feedback were significantly influenced by the gender of the test-takers. It should be noted that this differs from the current findings of related research (DeMars et al. 2013; Finn 2015; Marrs and Sigler 2012). However, the highly significant correlation between gender and the number of missing values on the economic knowledge test is remarkable, with female students showing more missing values. At this point, the ongoing discussion that was started several years ago about the extent to which the multiple-choice (MC) format influences the results in a knowledge test (Biggs 1999; Bridgeman and Lewis 1994; Ferber et al. 1983; Lumsden and Scott 1987) should also be referenced. MC items are seldom employed in the German educational system (Wuttke 2007). Therefore, students have a relatively low testwiseness in dealing with MC items, regardless of gender. In this study female students left more items unanswered, which could be because females take fewer risks on MC tests than males (on the subject of differences in risk aversion between the genders, see Powell and Ansic 1997; Byrnes et al. 1999; Weber et al. 2002). However, further research is needed to substantiate this conclusion. The low level of risk tolerance possibly resulted in less willingness to guess an answer in the case of uncertainty, which subsequently resulted in a higher number of missing values for female test-takers. The majority of missing values, however, could be attributed to a potential difference in knowledge between male students and female students.22 Because the male test-takers achieved better test scores, it is possible that they were able to respond correctly to more items and leave fewer unanswered. This surely is where more in-depth studies are needed of the influence of item formats and missing values. In this study no gender differences were found in self-reported test motivation or interest in receiving feedback indicators of test-taking motivation, no differences between male and female students were found. Short- or long-term consequences for students result from high-stakes tests (Finn 2015). Program for International Student Assessment. Trends in International Mathematics and Science Study. The transition system (“Übergangssystem”) offers a temporary solution to students (mostly with a low school-leaving grade or none at all) who were unable to begin vocational training after finishing school (Solga et al. 2014). Most courses in this transition system are neither standardized nor certified. The recent studies of vocational education conducted by Rausch and Kögler (2016) and Kögler and Rausch (2017) may be referred to at this point. The number of missing values is not a direct indicator of test motivation (see “Theoretical basis and state of research” section). Rather, it can be assumed that a low test motivation results in the abortion of the item or of the entire questionnaire, thus producing a higher number of missing values. However, a high number of missing values may also be explained by other causes and through other constructs (such as lack of knowledge or slow response behavior). Therefore, the missing values in this paper were incorporated as an external criterion that should correlate with test motivation. In addition to effort, Knekta and Eklöf (2015) refer to the following four additional aspects: expectancies, importance, interest, and test anxiety. Results of studies of change in test motivation are heterogeneous: while some indicate an increase in test motivation (e.g., Barry and Finney 2016), others indicate a decrease over the duration of the test (e.g., Penk and Richter 2017; Sundre and Kitsantas 2004; Wise et al. 2009). This heterogeneity in findings may be because both personal characteristics of the test-takers (e.g. ability) and item characteristics (e.g., difficulty) are responsible for changes in test motivation. Obligatory feedback means that the test-takers get a feedback regardless whether they ask for it or not. The state of research is not entirely clear as several studies have not provided evidence that promising feedback to students on their subsequent test performance impacts their test motivation (Wise 2004). However, studies revealing a significant correlation between feedback and test motivation predominate. Because the test administered in this study was in paper-and-pencil format, the average time spent on each item could not be determined (for analyses, see Liu et al. 2015). In future studies, tests could be administered on computers so that time spent on items can be recorded and modeled. See Förster et al. (2017) for a detailed analysis regarding both versions of the TEL4-G.
For copyright reasons, the German edition of the test cannot be presented. The items of the original American edition of the TEL4 are available on the following website: http://www.c3teachers.org/wp-content/uploads/2016/09/Walstad_Rebeck.pdf. The Student Opinion Scale is an instrument for assessing test motivation frequently employed in the USA (Sundre 1997; Sundre and Moore 2002; Sundre and Kitsantas 2004). This instrument measures interviewees’ self-assessed effort on tests as well as general attitudes toward taking tests (see theory-based model by Wigfield and Eccles 2000). For data protection reasons, obtaining information on the generation process of an individual code was not possible. In other studies, such codes may be generated by taking the third and fourth letters of the student’s place of birth or the second and third letters of his or her mother’s first name. After consulting with the data protection officer, the decision was made to generate an imaginary word (prominent athletes or politicians) despite overlaps that may occur. Although no comparison was made in this study between regular and vocational secondary school students’ performance on the TEL4-G, Happ et al. (Happ et al. (2018) found the average score on the TEL4-G of first-semester bachelor students at universities in Germany was 27.55 points, which is better than the score of the participants in this study. Congeneric reliability is an ordinary reliability index for Structural Equation Modeling (SEM) and can be compared to Cronbach’s Alpha. Converting the correlation of 0.171 into an effect size resulted in a value corresponding to Cohen’s d of 0.347, which is a small effect size (Cohen 1988; Rosenthal 1994). While we had 3 missing values for the gender variable the sample size for model 3 is 1015 instead of 1018 in the models 1 and 2. This field is different from general secondary schools in Germany because economic contents are not extensively incorporated into the curricula in all federal states (Förster et al. 2017). A first look at the data from the present study showed that self-reported test-taking motivation amounted to 2.36 (SD .904) for students of the vocational secondary school (berufliches Gymnasium), 2.31 (SD .874) for students of the commercial vocational school, and 1.93 (SD 1.147) for students of the upper vocational school (Berufsoberschule). Thus, further studies should pursue a school-type-specific modeling—in doing which a significantly greater number of cases is an essential prerequisite, particularly for the upper vocational school. There are studies in the literature reporting, from an international comparative perspective, both variations in the number of missing values on the domain-specific test in a MC format as well as variations in the effect size of the gender gap difference between male and female test-takers in economic knowledge (see Brückner et al. 2015; Förster et al. 2015). Here, starting points for further research can be found. Both authors contributed substantially to this work. RH and MF developed the theoretical framework of the paper. Data analysis for this paper was conducted by MF and RH. Both authors discussed the manuscript at all stages. Both authors read and approved the final manuscript. We particularly thank the two anonymous reviewers who provided very detailed, constructive feedback and helpful guidance during the revision of this paper. Not applicable. There is a copyright on the test instrument by the Council for Economic Education (CEE; US) and the data set cannot be shared. Taking part in the research project was entirely voluntary. All students consented to participate. A ethic committee was established at the end of 2014 at the department of business and economics at the University in Mainz. Until that point the design and the questionnaire was finished. We have still talked to a member of the ethics committee and he remarked no critical points in the questionnaire.